Eight years ago, I weighed close to 300 pounds. Prior to that, the last time I remember being average size was in second grade. Even then, the other kids were in the early stages of name calling and bullying. I lost 150 pounds seven years ago in a matter of just under 11 months. I did it through diet and exercise. It was fast and furious. I have some major regrets. I pushed and punished myself "Biggest Loser" style by making sure I worked out twice a day (most days) for at least two hours. Eventually, I grew to love the physical pain and discomfort. It was hard for me to take a rest day. I created so much physical pain through exercise that I didn't have to deal with my feelings. Physical pain is easier to tolerate. All of my meals were pre-planned. I never ate a meal with my partner. And if he accidentally ate from my string cheese or sugar-free gelatin stash, I flew off the handle. Like many folks, I thought THIS was how a person successfully loses weight. So, imagine my surprise when I lost 150 pounds and found it damn near impossible to maintain. No, it wasn't a loss of willpower. It wasn't my body fighting back with a lowered metabolism or non-existent leptin. It was because I was addressing only the surface level of my problems. I wasn't acknowledging the root cause of my morbid obesity. 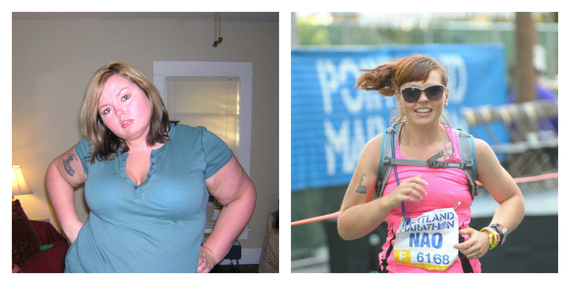 I struggled off and on for the first three years of maintaining my massive weight loss. Some days, I binged on an entire ice cream cake, a large pizza, and a 12-count package of cookies from the bakery all in one sitting. Other days, I ate clean and was compliant to the Paleo lifestyle while preaching the good news of eating pasture-raised bacon. I spent years believing something was wrong with me biologically because I struggled so much with food. I tried new sugar detoxes, clean eating programs, and briefly joined Overeaters Anonymous (which only made it worse). No special way of eating, no supplement, no workout routine helped my keep the 150 pounds off. When I didn't get my way, I lashed out at people. When the overwhelm of work and school became too much, I binge ate my anxiety while writing essays and studying for big exams. When my dad passed away, I ran a half-marathon to not feel the pain and regret of our lack of a relationship. I juggled multiple problems that contributed to my weight struggle: an all-or-nothing way of thinking, no self-compassion whatsoever, tons of self-judgement, over-identifying with stuff, setting unrealistically high standards for myself and others, and a total lack of self-awareness. Having been raised in a dysfunctional household with many childhood adversities, it took a toll on my beliefs, attitude, and behavior. According to one large-scale study, childhood trauma teaches the brain and body to handle stressful situations much differently than someone with little to no childhood adversities. I was almost always in fight-or-flight mode. I reacted to even the smallest amount of stress with complete frustration and anguish. My first step to healing was to admit that even though I lost 150 pounds, I was still the same person. I still had the same emotional baggage and fixed mindset that was a gooey ball of shame, pride, apathy, need for certainty, and passive-aggressive smugness. Before I could maintain my weight loss in a healthy and happy way, I had to face my emotional dragons head on. It's the most uncomfortable process I've ever had to do (but also the most rewarding). 1. I found ways to enjoy my lifestyle change. I learned early that I had to do what I liked--no matter what scientific studies claimed to be best or what experts were spouting out as gospel. I had to find a way to be physically active that was maintainable and fun for me. Eating also had to be a flavorful experience. It didn't need to be "right," but it needed to be mostly healthy. 2. I learned more about my personality. This helped me start the journey to developing self-compassion and better relating to others. When I understood that so many others share the same personality (and there's nothing wrong with it), I stopped striving to be someone I wasn't. No amount of achievement could change who I was. I embraced my authentic self more and more each day. 3. I worked on becoming more mindful of my thoughts and behaviors. My husband often had to "put me in my place" when my reaction towards something (or someone) became too negative. By talking it out with him, I humbly learned that I was over-identifying too much with something that aggravated me. 4. I learned how to become present with my emotions and give them names. They weren't just "good" or "bad" feelings. This helped me understand how I could heal myself in productive ways without another binge. 5. I accepted that it's OK to have negative emotions. Constantly striving to get back to a happier feeling often made me feel like something was wrong with me. Respecting all of my emotions as valuable parts slowly gave me more peace. Much like in the movie Inside Out, I needed all of my emotions to deal with the realities of life. 6. I embraced the adventure. I drastically lowered my expectations for how certain events in my life were supposed to turn out. "How can I make this an adventure?" became my go-to question when conditions were less-than-favorable. My brain helped me find ways to enjoy the experience even though it didn't turn out as planned. 7. I started to recognize "not good enough" messages in media. So much of disordered eating behavior is linked to the message of "you're not good enough." It seems so innocent that you even hear it from your friends and family. It can range from "You are what you eat. So, don't be fast, easy and cheap" to your "guilt-free" chocolate chip cookies which implies you should feel guilty for having a treat. I allowed myself to feel anger towards these messages instead of shame. 8. I stopped identifying myself according to my actions. Labels (both good and bad) limited me. They often made me feeling powerless or uncomfortably incongruent with who I was supposed to be. When I struggled with binge eating and obsessive thoughts about sugar, Overeaters Anonymous told me I was a "sugar addict." When I called myself a runner, I had internal fist fights with the part of me that wanted to settle for a hike rather than a run. Have you struggled with maintaining your weight loss? Was it a deeper issue than just the food you were eating?